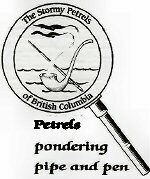 The Stormy Petrels of BC will celebrate this special event at The Vancouver Alpen Club on March 16, 2019. There will be the usual skits and some surprise skits performed by the Petrel Players. There will be some amazing door prizes and a wonderful buffet. Easily accessible by transit. Plenty of free parking. Please RSVP as soon as possible so we can prepare. Space is limited.